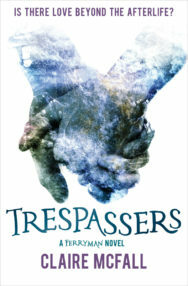 This month sees the launch of Trespassers, the much-anticipated sequel to YA author Claire McFall’s debut novel Ferryman. 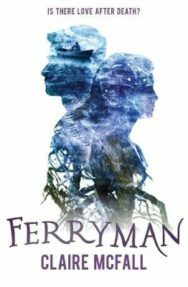 Charting the unbreakable bond between train crash victim Dylan and Tristan, an immortal guide who must lead her soul safely to the afterlife, Ferryman won a Scottish Children’s Book Award, was long-listed for the Branford Boase Award and was nominated for the Carnegie Medal. But that’s not where the Ferryman story ends. A rights deal secured in June 2015 has launched McFall into superstardom in China, where she was the only UK author in the 2016’s Top 10 Fiction Bestseller list. With more than one million books sold worldwide, the arrival of Trespassers is sure to kick up an international storm. Read on for an extract of Ferryman, which has been reissued by Floris Books ahead of the Trespassers release…. He was sitting on a hill to the left of the tunnel entrance, his hands wrapped around his knees, and he was staring at her. From this far away all that she could tell was that he was a boy, probably a teenager, with sandy hair that was being tossed around by the wind. He didn’t stand or even smile when he saw her looking at him, just continued to stare. There was something odd about the way he sat there, a solitary figure in this isolated place. Dylan couldn’t imagine how he had come to be there, unless he ’d been on the train as well. She waved at him, glad to have someone to share this horror with, but he didn’t wave back. She thought she saw him sit up a little straighter, but he was so far away it was hard to tell. Keeping her eyes firmly on him, just in case he disappeared, she slipped and slid down the gravel bank of the train tracks and hopped over a little ditch filled with water and weeds. There was a barbed-wire fence separating the tracks from the open countryside. Dylan gingerly grabbed the top wire between two of the twisted metal knots and pulled it downwards as hard as she could. It dropped just low enough for her to awkwardly swing her legs over. She caught her foot as she pulled her second leg over and almost fell, but she managed to cling on to the wire and keep her balance. The barbs cut into her palm, piercing the skin and causing little droplets of blood to ooze through. She examined her hand briefly before rubbing it against her leg. A dark stain on her jeans made her take a second look. There was a large red patch on the outside of her thigh. She stared at it for a moment before remembering wiping the sticky stuff from the carriage floor off her hands. Realisation made her blanch and her stomach heaved slightly. Shaking her head to rid herself of the sick images that were swirling in her brain, she turned from the fence and fixed her eyes back on her target. He was seated on the slope about fifty metres above her. From this distance she could see his face, and so she smiled in greeting. Slightly abashed by this frosty reception, Dylan stared at the ground as she made her way up the hill towards him. It was a hard climb and before long she was panting. The hillside was steep and the long grass was wet and difficult to wade through. Looking down, concentrating on her feet, gave her an excuse not to make eye contact – not until she had to. With cold eyes, the boy on the hill appraised the girl approaching him. He had been watching her since she had exited the tunnel, emerging from the dark like a frightened rabbit from a burrow. Rather than shouting to get her attention, he had simply waited for her to see him. At one point he had been concerned that she would head back into the tunnel, and he had considered calling out, but she had changed her mind, and so he’d contented himself with sitting silently. She would notice him. He was right. She spotted him and he saw the relief pool in her eyes as she waved energetically. He did not wave back. He watched her face falter slightly, but then she approached him. She moved clumsily, catching herself on the barbed-wire fence and tripping on clumps of wet grass. When she was close enough to read his expression he turned his face away, listening to the sound of her drawing nearer. Claire McFall is a writer and a teacher, living and working in the Scottish Borders. Along with Ferryman and Trespassers, she is also the author of dystopian thriller Bombmaker and her paranormal thriller Black Cairn Point, winner of the Scottish Teenage Book Prize 2017. Get your tickets to see Claire at the Edinburgh International Book Festival on 26 August 2017 here. Ferryman by Claire McFall is out now published by Floris priced £7.99. Trespassers will be published by Floris on 14 September priced £7.99.